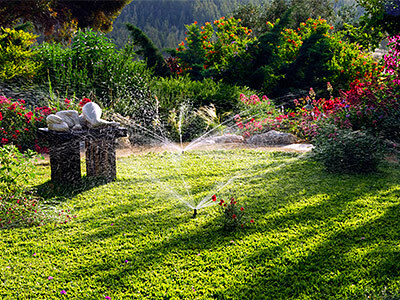 If you're looking for a California landscaping company that can handle sprinklers and irrigation tasks efficiently and professionally without breaking your budget, then get our services here at Gilgert's Landscaping. With our more than 25 years of experience in this business, you can bank on our ability to create an irrigation system that will take care of your plants' and trees' water requirements. Aside from this, we can also install high quality sprinklers to make watering your lawn effortless. With our help, you can enjoy healthy plants, trees, shrubs, and lawn grass that your family and guests will surely appreciate, too. Irrigation systems have long been in use, dating way back in ancient times, like in Egypt during the time of Pharaohs. This system of supplying water to crops, plants, and other greens should also be present in your landscape if you wish to keep your greens healthy. Fortunately, our workers know which type of irrigation system will work best in your outdoor area. They can conduct an ocular inspection to have a clear idea of your watering needs. From their visit, we will know which system we will install for you. Overhead. This system is composed of sprays or guns with high pressure water coming out of them. This works great for both small and big landscapes. Surface. This system of watering plants is among the oldest and most popular. It has three sub-types, namely: furrow, basin, and borderstrip. The amount of water that will flow into the plants can be controlled by a dike system. Drip. In this system, water literally drips out of a device, aptly called a dripper. This type is a more efficient system because the water drips directly on the roots of plants. Sprinklers are important additions to any landscape or lawn. As it is, these watering devices help keep lawns looking healthy even during summer when the heat of the sun can take away moisture in soil. The working area. Of course, knowing how big or small the area to be watered is a primary consideration. We base the type of sprinkler to use on the actual area to be covered by the system. Type of plants. Some plants could die when the wrong sprinkler system is installed; hence, we also take into consideration the plants that you have in your lawn or garden. Topography. There are times when we need to install sprinklers in stony areas, or in landscapes with very poor soil. Knowing the type of soil and the general composition of the area could help us decide on the perfect sprinkler type to install. Gilgert's Landscaping offers sprinklers and irrigation systems that will ensure a hassle free lawn and garden maintenance for you. We can also install timers in your sprinkler system for a fully automated watering. 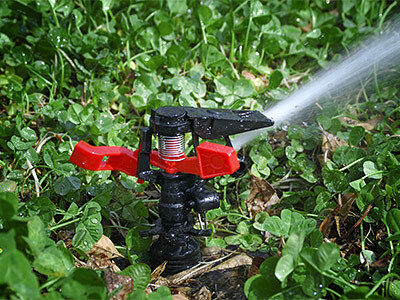 We likewise use premium products from leading suppliers of sprinkler in the country. And before we leave your landscape we ensure that all the systems are working efficiently. We can even perform maintenance tasks if you want!